When you start to design an interior visualization project with Blender you will try to get textures and materials that can represent the mood for the project. If you want something clean, you will start with lots of white and shades of light gray. How much can you change a project using textures? 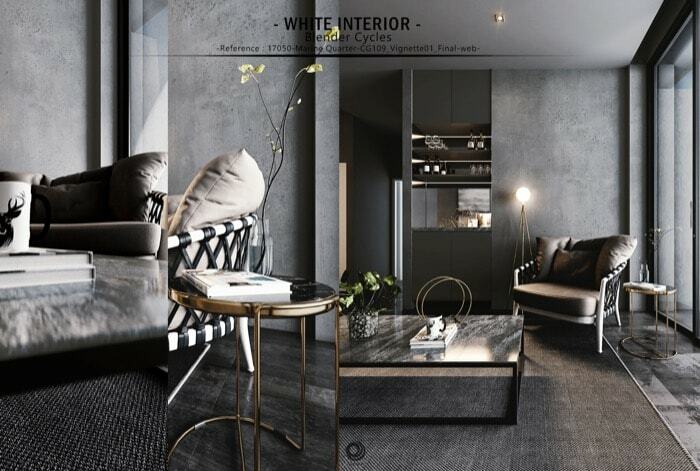 Do you remember a project featured here in Blender 3D Architect back in January and called White Interior? The project was a design by Rio Suryonugroho, and you should definitively take a few minutes to check the project, because he shares a lot of the settings for Cycles, including light setup. He manages to make a new version of the same project using a different set of textures, which made the interior assume a more darker look. The final results show how much you can change and manipulate from a project using textures. You will find several images from the project and also close-ups from details like furniture. What about the settings? If you want to check the settings for this particular project, you should take a look at the White Interior article to get a glimpse on how to make a similar scene. For those of you willing to develop your skills on interior planning, I strongly recommend the Residential Interior Design: A Guide to Planning Spaces for a detailed explanation on how to arrange and design great interiors, no matter what software or technology you are using. Disclaimer: Some of the links above might be affiliate links, meaning, at no cost to you, we earn a commission if you click through and make a purchase. If you decide to purchase using our links, you will be helping us with the maintenance of Blender 3D Architect. Thank you for your support!